Unlike its very successful sedans and hybrids, Toyota has found the full-size pickup market a much harder nut to crack here in the U.S. of A. But the fact remains that a 10% retail market share in a segment largely dominated by loyal owners who for decades have been buying from the domestic automakers is still nothing to sneeze at. 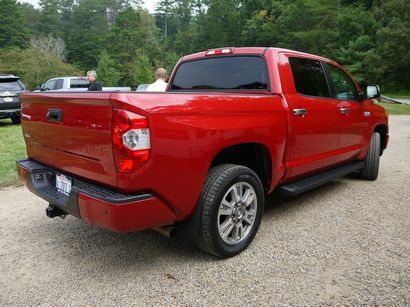 In 2013 Toyota expects to sell a mix of 107,000 2013 and 2014 models by year's end, while next year it's projecting 2014 Tundra sales to rise to 137,000. We say this with some confidence as these figures were shared by Toyota's marketing people at a recent ride and drive event hosted by the automaker at the über-exclusive (and highly-recommended, we might add) Blackberry Farm resort located amidst the majestic Smokey Mountains in Walland, Tennessee. 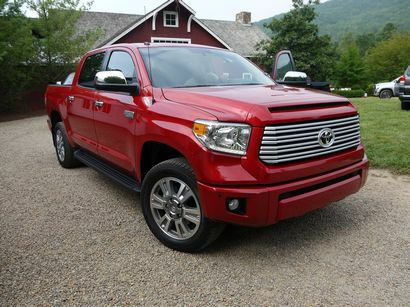 And while you can argue the fact that Toyota's full-size half ton is hardly "all new" for 2014, it certainly can't be debated that it's as close as any vehicle in its segment to being all-American. 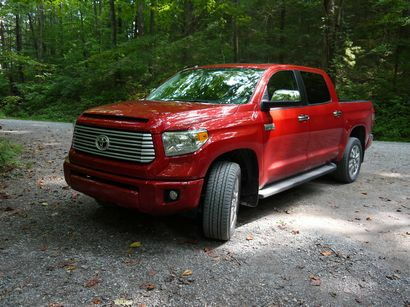 Consider this: The new Tundra has 75% North American content. It was designed in California and engineered in Michigan. 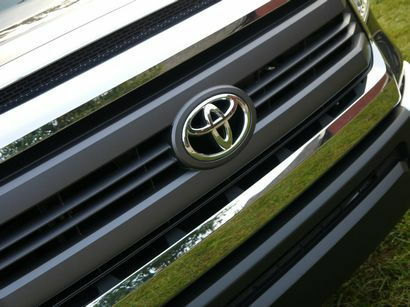 Its engines are built in Alabama, the transmissions in North Carolina and it's all put together at Toyota's assembly plant located in San Antonio, Texas. The motto for 2014 essentially boiled down to the maxim of "if it ain't broke, don't fix it." To that end, the body ‘hard points', platform and engine choices remain unchanged from 2013. The front suspension retains its independent, high-mounted double wishbone setup, but tweaks include re-tuned rear shock absorbers that increase damping in the low- to mid-speed range for improved ride over harsh surfaces and enhancements to the steering system that reduce the feedback from road variations and imperfections for better straight-line stability and less driver fatigue. Under the hood, buyers will find the same three engine choices: a 270 horsepower 4.0-liter DOHC V6 as well as two V8s – a 310 horsepower displacing 4.6 liters and the most popular choice, their 5.7-liter 32-valve 3UR-FE producing 381 horsepower and 401 lb.-ft. of torque. The V6 is mated to a 5-speed automatic, both V8s get Toyota's 6-speed while the version on trucks equipped with the 5.7-liter also feature a tow/haul mode. 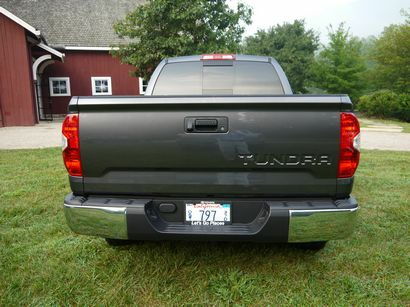 Toyota notes that while current Tundra owners have been happy about their trucks performance and handling, they were less enthusiastic about its styling noting that the 2013 model was too "bubbly" looking. 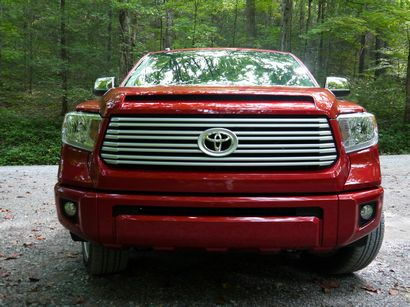 As a result, the newest Tundra features what Toyota calls a more "chiseled" look. Along the sides, character lines are more creased, while fenders and wheel wells were squared off. Up front a more prominent six-sided grill integrated into a prominent hood scoop. 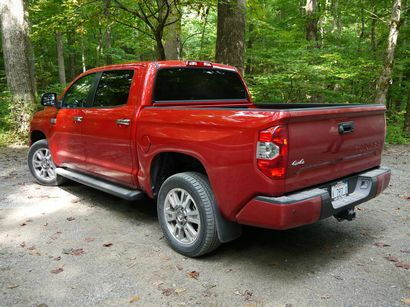 In back, there's a new bed design, a tailgate with an integrated spoiler and "TUNDRA" stamped into the tailgate, while below and just like up front is a new rear bumper that's been changed from one-piece to three for lower replacement costs. Three cab styles (regular, double and CrewMax) are offered, with regular and double available with either a standard (78.7) or long bed (97.6) while the CrewMax comes with a 66.7 inch bed. 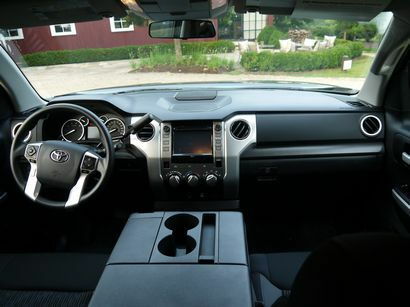 The interior of the 2014 Tundra is all-new and comes in five variations associated with the trim levels: SR, SR5 , Limited, Platinum and 1794 Edition. 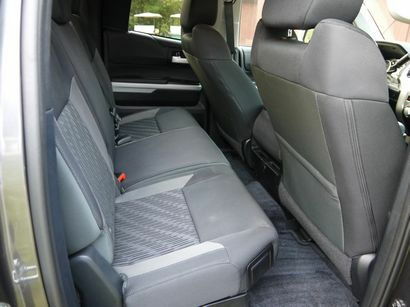 All models including the base SR feature a redesigned dashboard, door trim and a new seat design for better support. Also standard is a center-mounted LCD display screen. 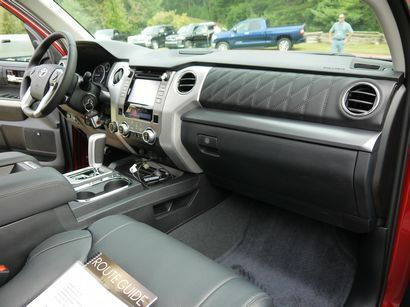 SR5 models feature a "professional gear" theme with fabric seats with unique stitching, metallic accent trim along with new soft touch instrument panel surfaces. 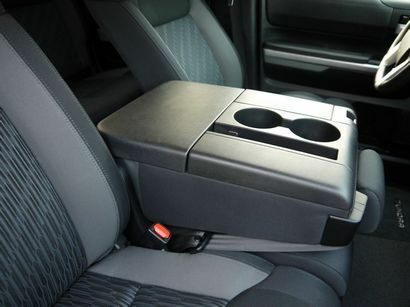 CrewMax rear seats no longer recline, but they can now be folded up for an additional 11 inches of load height. The Limited's "Active Premium" mission adds soft touch console and door surfaces, dual zone HVAC controls, wood-style trim and leather seating surfaces. Buyers checking the Platinum grade box will get perforated, diamond pleated premium leather seats (heated and ventilated in front), with matching door and instrument panel inserts. Also part of the package is a 12-speaker, touch screen Entune JBL audio system with navigation. For 2014, the penultimate grade is the 1794 edition, in honor of the year the JLC Ranch, on a portion of which the San Antonio facility was built on, was founded. Among other luxury accoutrements, seats are trimmed in premium brown embossed leather with ultrasuede accents, with matching soft-touch accents on the shift console, front and rear door trim and instrument panel. Entune, JBL audio and heated/cooled front seats are also part and parcel of this model. I had a chance to spend roughly two hours each in both a Premium 4x4 CrewMax as well as a DoubleCab SR5 equipped with a TRD Off-Road Package featuring Bilstein gas-charged mono-tube shocks and 18-inch TRD Off-Road alloy wheels. Both trucks tracked nicely and felt very stable in everything from single-lane gravel mountain roads to smooth tarmac. The steering was responsive and the brake pedal provided excellent feedback and was easy to modulate. 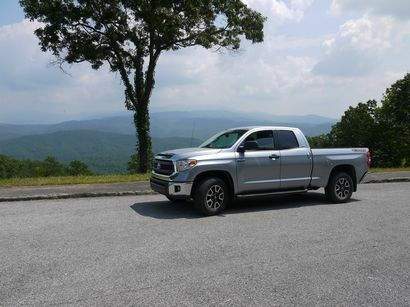 The SR5 with the TRD package, in particular, was a hoot to drive, as we were able to pilot it on a portion of the Dragon's Tail in the Great Smokey Mountains. 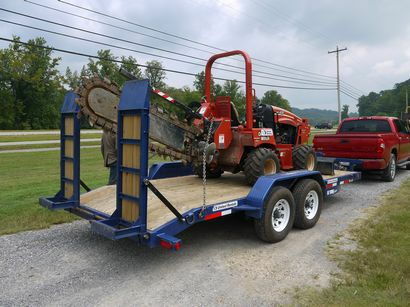 Toyota also gave us a brief chance to check out its towing capabilities – a six-mile round trip hauling a Ditch Witch RT45 tractor with an H314 attachment atop a twin axle trailer with a combined weight of 8,000 pounds hooked up to a Premium Edition MaxCab with the 5.7-liter V8. When we got back, one of Toyota's reps asked us, in jest, if we could tell if there was anything behind us. Truth be told, we could, but it didn't feel like it was anywhere near 4 tons the ride was so stable. As is its wont, when it has a well-established vehicle on its hands Toyota tends to be conservative in its re-designs. And while it's easy to criticize this kind of decision, the fact is that the current Toyota faithful will undoubtedly be pleased that the manufacturer decided not to mess with its solid underpinnings. 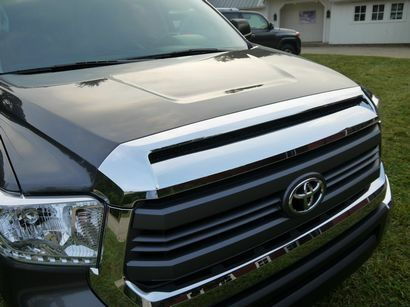 In addition, the new styling is just bold and edgy enough that it's very clear that the latest Tundra should also attract even more new buyers to the Toyota fold.